I have a post here for you die-hard chocolate fans. 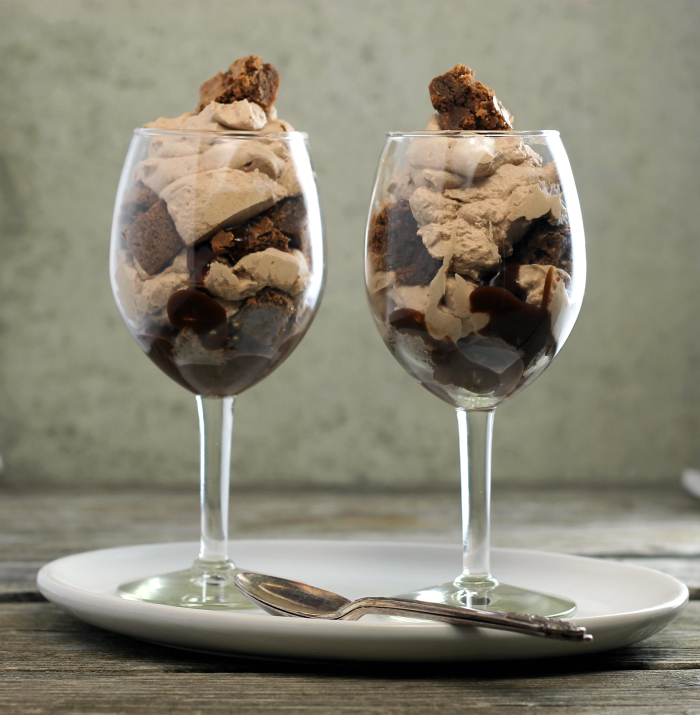 This brownie parfait is definitely a dessert that is full of chocolate. This is one of those desserts that you will have to throw your diet out the window, but let me assure you it is worth every calorie. The oldest of our children turns 30 on Monday. How can that be? Time has been flying by way too fast. It seems as though it was only yesterday when she was a little girl. Now she is grown and has two children of her own. She came over for the evening tonight, so I wanted to surprise her with an early birthday dessert. She is a chocolate lover. I guess that I can say that she gets that from me. Needless to say that she enjoyed her early birthday dessert. But, I mean really if you are a chocolate lover you have to love this dessert. Here is the low down on the dessert. I layered brownies, hot fudge sauce, and chocolate whipped cream for this dessert. Yes, even the whipped cream is chocolate in this dessert. I knew that my daughter is not a big fan of whipped cream, so I decided to add some cocoa to it. The only thing that I didn’t like about this dessert, was taking pictures of it for the post. I am afraid that my pictures don’t really show how delicious the whole dessert is, but please take my word for it… you can’t get much better than this when it comes to chocolate. 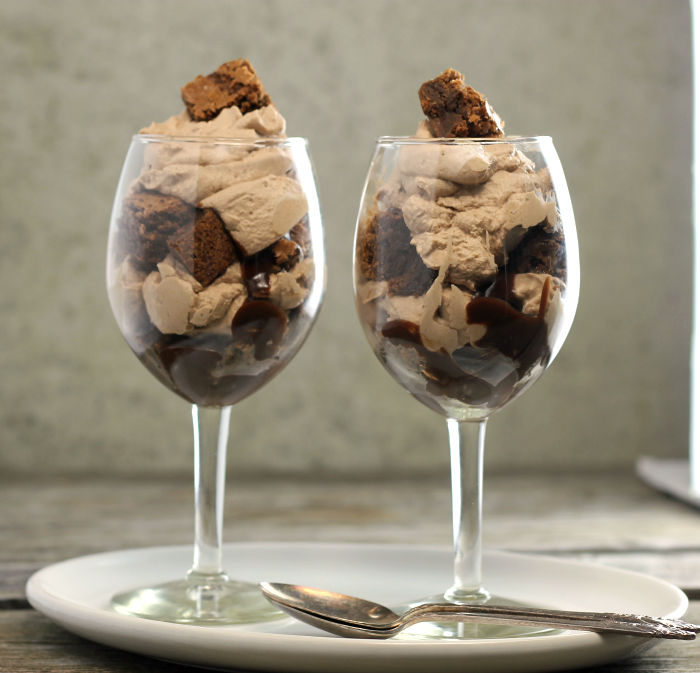 I hope you will enjoy this brownie parfait and try it for yourself. Hot Fudge sauce- Combine the sugar, cocoa, cornstarch, and salt. Add the water and stir until the mixture is smooth. Microwave on high for 1 1/2 minutes, stirring after 45 seconds. Add the butter, stir in and microwave for another 30 minutes. Stir in the vanilla. Let cool slightly. Chocolate whipped cream - In a large bowl add the heavy whipping cream. Beat with an electric mix or immersion blender until soft peak begins to form, add the powdered sugar and cocoa powder gradually until you have the correct taste. Be sure not to over beat. To assemble- Cut brownies into small bite size pieces. Add brownies to a bowl or glass, spoon the hot fudge over top of the brownie bites, spoon the chocolate whipped cream over top of the hot fudge sauce. Repeat. Happy Birthday to your oldest. Very cool that you made her this dessert. What a lovely way to fancy up a brownie! The chocolate cream is an unexpected bonus. Nice touch! I’m mad for chocolate, but I’ve never seen chocolate whipped cream before. I will definitely be trying this out. Dawn, my chocoholic family would be thrilled with this dessert! Such a superb trio of chocolate components!!! Ohhhh….I love chocolate – I would love these! 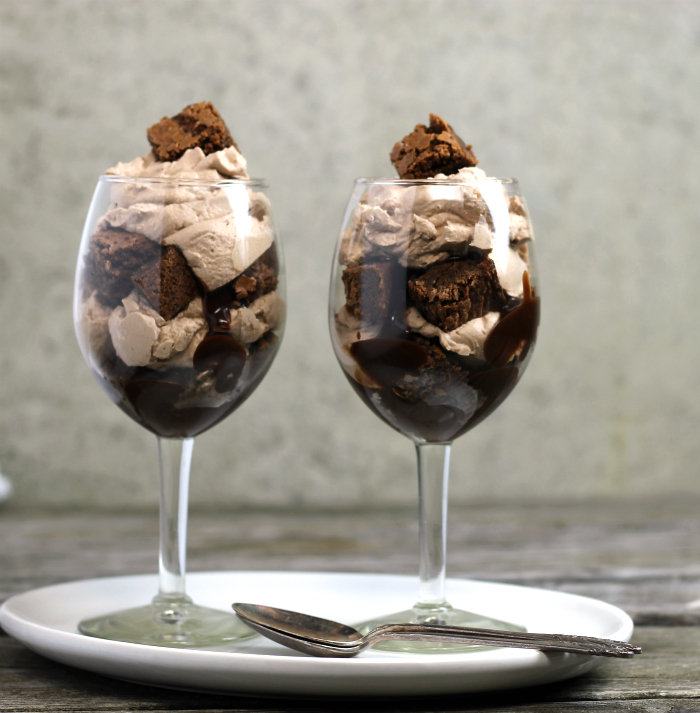 These brownie parfaits look beautiful & delicious!